1. I rather like the idea of a whole nation celebrating one of my favourite activities. 2. It reminded me I really should remember to tweet more. Perhaps it’s a good omen? Or like the serendipity which goes into a good kiss? I guess you’ll have to read my book and decide for yourself. It will be out on Amazon and Kindle on the 22nd July 2015. My interest in short stories developed from my blogs, with female readers in particular responding well to romantic yarns - the good, the bad and the ugly. The book idea emerged over lunch with friends and, as singing and kissing are two of my favourite things, that led naturally to the book’s hook... and from there a theatrical title and musical theme. It developed so organically I decided I should trust and go with it – like a good kiss really... you don’t want to over think it! So thank you to all my blog readers over the past few years on www.blogjulie.com and www.blogjuliearts.com If not for you my focus for this project might never have come together. And that’s why I’m making an exception today and posting the same news on both my blogs. 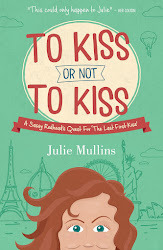 If you like to kiss - or you agree with me that a kiss can work miracles – please check out www.juliemullins.co.uk for a little preview. TO KISS OR NOT TO KISS. Romance in bite-sized pieces.